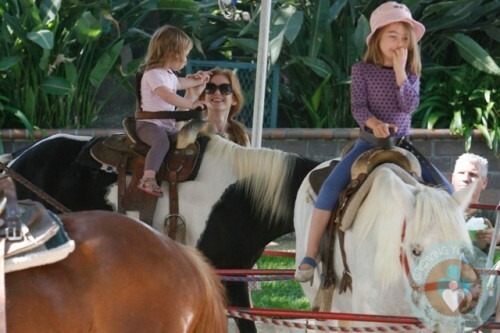 Taking a break from promoting her new film The Bachelorette, Isla Fisher spent the afternoon on Sunday visiting the petting zoo at the Studio City Farmer’s Market with her girls Olive and Elula. Not there for the food, the ladies enjoyed the petting zoo, pony rides and the swings. Olive looked on as Isla placed a guinea pig on Elula’s lap, but was first to get on the ponies when it was her turn to ride.